Many Christians go through their lives never truly experiencing the Holy Spirit. Maybe it’s due to lack of understanding of the Spirit or an over correction in response to more of the “charismatic types” of Christians. Either way, many Christians, who do indeed possess the Holy Spirit, go through their daily routines that look very similar to those around them who are non-Christians who do not possess the same Spirit. Jared Wilson, in his book Supernatural Power for Everyday People,” helps Christians understand how everyday followers of Jesus can experience the supernatural work of the Holy Spirit. Wilson helps the reader see how the Spirit is at work in every aspect of the Christian’s life. The Spirit is working in everything from convicting us, helping us in our spiritual disciplines, comforting us during hard times, gifting us with spiritual gifts, and much more. I’m a huge fan of Wilson’s books and once again this one didn’t disappoint. I really enjoyed reading a book that was on the topic of the Holy Spirit but was not a “Systemic Theology” type of book. Wilson dives into the topic of the Holy Spirit in a way that’s easy for the reader to understand no matter their theological background or experience. This book reminds me much of Francis Chan’s book Forgotten God as it calls Christians to a similar thing – living their lives saturated with the Holy Spirit. He’s not some mystical, third being of the Trinity that we can’t experience. He’s quite the opposite really. He is God’s presence with us always. Wilson wants Christians to not miss out on this amazing truth as they go about their lives. Two parts of this book really stood out to me. First, the chapters on Bible reading and prayer. In these two chapters Wilson helps Christians see how the Spirit aids in these two important spiritual disciplines. He includes some very practical tips as well in regards to practicing these disciplines. Second, the chapter on spiritual gifts. In this chapter Wilson gives a quick overview of spiritual gifts and then argues his case for why the “sign gifts” should not be seen as gifts that have ceased but instead of relevant to the church today. He gives three very compelling arguments for his stance: experiential, historical, and Biblical. I’d encourage any Christian who feels like they are in a rut and not experiencing God’s working in their lives to pick up this book and give it a read. It will help them see that God, through His Spirit, is indeed working and wants to help you experience His power as you go through your live as a follower of Christ. In Galatians 5:16, Paul says, “…walk by the Spirit, and you will not gratify the desires of the flesh.” Paul expresses the same idea in Romans 8:4 when he says, “…who walk not according to the flesh but according to the Spirit.” Over the years I have read these verses and so many others that deal with the idea of walking or living in the Spirit. I have even done my best at applying these verses, but I don’t believe I have really ever understood what it means to walk in the Spirit until I recently read Walking in the Spirit by Kenneth Berding. I got this little book free for when I signed up to be an Impact member with Crossway. The Impact membership allows you to pick three free books when you make a purchase on Crossway. Once a member, you have the opportunity to pick your three free books throughout a year. You also get discounted prices on other Crossway books. When you become an Impact member you pick what you want your yearly fee to be. Also, when you order from Crossway, 5% of your spending goes to a ministry of your choice. It’s a neat program that is worth checking out! Back to the book. Walking in the Spirit was one of the best Christian living type books I have ever read! Other than the Bible, this is one of those books that made a huge impact on my spiritual life. 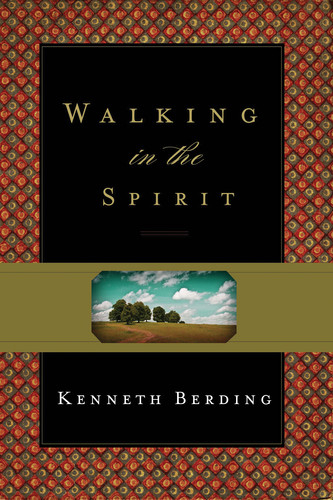 The principles and thoughts shared from Berding in this book helped me learn what it means and looks like to walk in the Spirit. This book will defiantly help you learn how to walk in the Spirit practically and how to instruct others to walk in the Spirit. I would encourage pastors, teachers, and anyone who teaches to Bible to read this book so you can better understand Paul’s idea of walking in the Spirit. Each chapter ends with a few review questions which makes this a great book for small groups or even a teaching series. Also, the end of the book has a few appendixes that will help you dig dipper into this idea and help you apply what you learned. Again, this is a book that is worth putting on your reading list and reading sometime. Click here to order a copy of Walking in the Spirit from Amazon for a great price! Kenneth Berding is professor of New Testament at Talbot School of Theology at Biola University and has wrote several books.